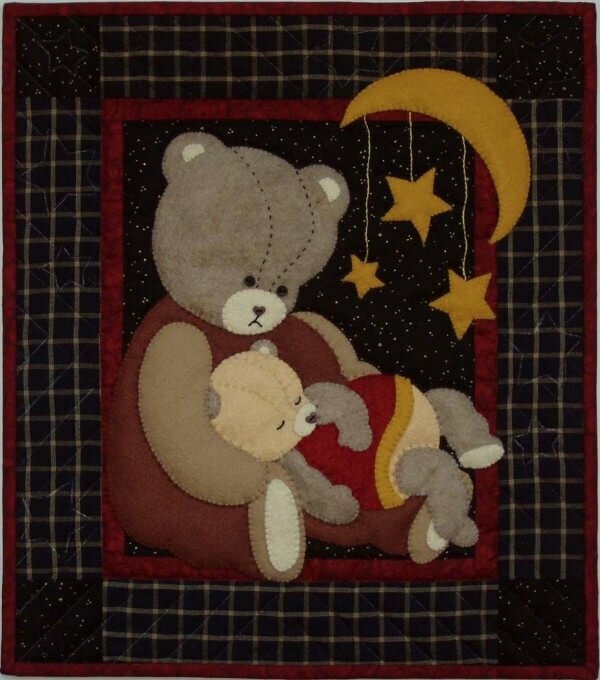 This little wall quilt holds all the devotion of a mother's love. Nestled peacefully in his adoring mother's lap, Baby Bear dreams of clover fields and sweet honey. The tender scene unfolds beneath a trio of stars hanging from a crescent moon. Finished size is 13″ x 15″. Colors are black, brown, sandstone, camel, off-white, red, and gold. Kit includes all wool felt for appliqué shapes, all fabrics (100% cotton) for background, borders, back, and binding, batting, buttons for eyes and noses, embroidery floss, precise patterns and complete instructions.